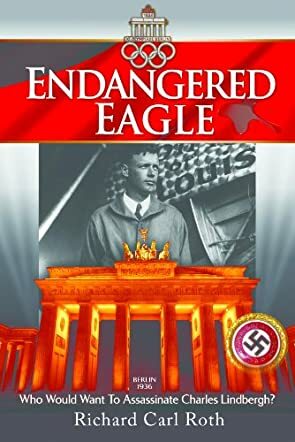 It is 1936 in Berlin with the start of Richard Carl Roth's historical fiction novel, Endangered Eagle, A Karl von Ernst Mystery. Hitler is at the helm and Germany is preparing for the world to arrive for the Summer Olympics. In an effort to bolster the image of the Third Reich, Charles Lindbergh has been invited to Berlin by General Hermann Goering ahead of the games, following his resettlement in England after the kidnap and murder of his son. When a scheme to kill Lindbergh on German soil becomes known to Goering, he enlists the expertise of retired Chief Inspector Karl von Ernst to put a stop to the assassination at any cost. Failure is not an option in the precisely orchestrated Nazi P.R. plan. Endangered Eagle is an interesting story in the aptly coined spirit of “faction”...fiction with its roots firmly planted in meticulously researched, non-fiction details. Richard Carl Roth has definitely done his homework, and no stone remains unturned when it comes to the factual elements of everything and everyone who is described. The plot is a good one, and while the formalities of the era filter through the dialogue, Roth's narrative takes on a tone reminiscent of Tom Clancy, where the technical aspects feature prominently and are polished to a high enough shine that the aficionados of authenticity will squeal with delight. I'd highly recommend this book to readers who appreciate historical fiction with a suspenseful twist and enough intrigue to keep the pages turning, even when you know how it really did end.